Brainstorming is a technique to generate ideas. Participants are asked to think and quickly generate ideas around a question, problem or opportunity. The only rules are “no idea is too crazy” and “generate ideas, not critique.” Without these barriers the oddest and most unexpected ideas can lead the discussion to something very constructive. It is often used as a divergent process to stimulate creativity and innovation and paired later with convergent processes to cluster and evaluate the ideas. For more definitions click here. The initiator of the brainstorming method is Alex Osborn. The method was first presented in 1948 in the book called “Your creative power”. Brainstorming is used when you want a group of people to share their ideas with you on a particular topic or question. This would be to help you define an idea, an approach, a strategy. It can also be used to help a group break out of entrained or patterned thinking that is blocking the development of new ideas. (Also called “getting out of your rut!”) Because brainstorming is fast, easy and can be very inclusive, it is useful when you need to harness the energy and brain power of a group of people that you foresee working together on an issue. Size of group impacts how brainstorming is done. 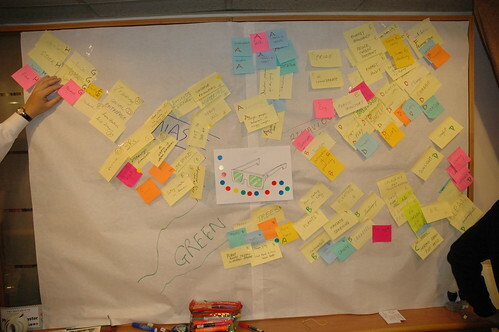 In groups of 15 or less, it is easy to capture the flow ideas as they are generated. In larger group you may wish to break into smaller groups for the brainstorming, then compare results across groups. 1. There are no bad or ideas that are too crazy. Let your imagination lose. Sometimes the craziest idea is the seed of a fabulous idea. 2. Offer only ideas, not judgment of the ideas. That comes later. Judgement during brainstorming can stop the flow of ideas and creativity. The facilitator asks the question or states the brainstorming challenge. Participants speak out their ideas or write down their ideas to share them later. If spoken aloud, a facilitator captures the ideas on flip charts or white boards. Use of cards to write down individual ideas can be useful. Importantly, you let the brainstorming take and follow its own course, without directing it. When people stop offering ideas, let there be silence for a minute or two. Sometimes there are a few more ideas that come up out of that silence. This can also be a good point for reflection on the experience. People are often exhilarated and surprised by the creativity that was unleashed. For online brainstorming, you can have people write their ideas in a chat room, white board, or via instant messenger. In a recently held knowledge sharing event at IDLO, one of the issues that was presented was about a corporate tool (in this case an intranet portal for knowledge sharing (K-Café)) to encourage and cultivate knowledge sharing in an organization? The unique problem with this issue was that the intranet was accessible only to 6 of the participants in the workshop. For this very reason, getting the “right” method for this session was critical for its success. I decided to use Brainstorming method and it went very well. To see the details read my blogpost: Using brainstorming method to draw out ideas> – Gauri Salokhe, FAO. Brainstorming can cause people to laugh. Use that spirit of playfulness to ignite people's creativity. Some people feel that brainstorming can dilute ideas by moving too quickly. Notice if seeds of ideas need to be taken and nutured after the brainstorming. Where people are reluctant to speak up, use written brainstorming, asking people to write down one idea per card or post it note.